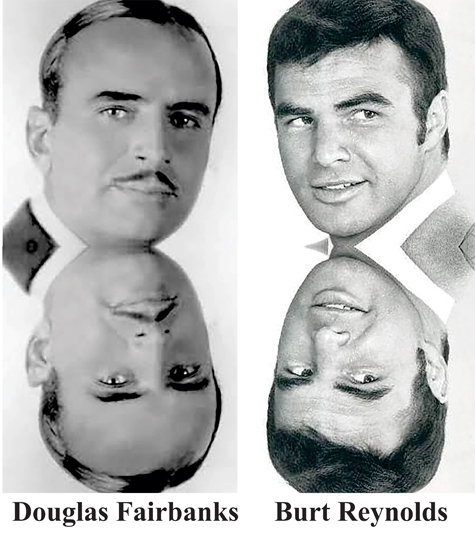 When a fan of our website forwarded the hypothesis that Burt Reynolds was the reincarnation of silent movie star Douglas Fairbanks, I was surprised, but at the same time I felt it was true. I found that Fairbanks and Reynolds have similar facial architecture. Click on images to enlarge them. Further, they were both action figures in movies, athletes and they did their own physical stunts in movies. In a session with world-famous trance medium Kevin Ryerson, Ahtun Re, a spirit guide that Kevin channels who has demonstrated the ability to make past life matches with a high degree of accuracy, affirmed that Burt Reynolds was the reincarnation of Douglas Fairbanks. Douglas Fairbanks | Burt Reynolds in Blazing Saddles: Such Little Feet! 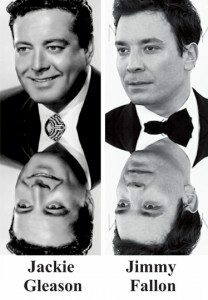 Physical Resemblance in Reincarnation Cases: The facial features of Douglas Fairbanks and Burt Reynolds are similar, as are those of Jackie Gleason and Jimmy Fallon. Past Life Talent: Douglas Fairbanks was a dashing, leading man in the silent era of Hollywood, as was Burt Reynolds in more contemporary times. Jackie Gleason and Jimmy Fallon have been comedy icons in two incarnations.